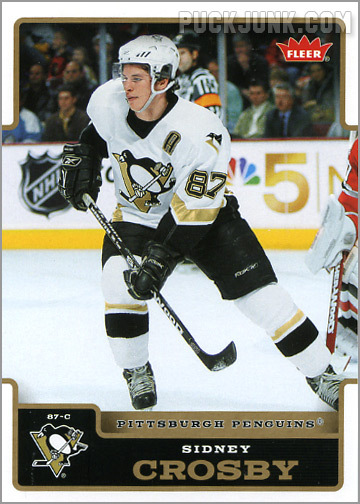 Im nowhere near a Pens or Flyers fan, but those Stadium Series jerseys for a one game special even aren't that bad. Nothing big here for the stadium series, just a 2 color jersey look. And of course the Flyers ruin a decent jersey with more contrasting name bar nonsense. I know teams need to justify having a design department, but the ideal TB alt could be designed by any one of us. The jersey that everyone wants is black, features the modern logo, avoids the wordmark, and keeps the blue and white as striping throughout. Make that jersey, give the people what they want, and make some nice $$$ from it. Black jersey. If you love the speckled look, maybe try it for the hanger effect or somewhere minimal. Striping of white/blue/white on the arms and the waist. You'll look good. You'll differentiate yourselves from the Leafs. You may even have stumbled upon the future primary jersey of your team. Oh well. It's unreal that teams are literally taking money out of their pockets by overthinking the design process and going with substandard gar-bage. Hey guys, check out the brief article I wrote about the Stadium Series jerseys that will be worn in three weeks for the 2019 Stadium Series game. Sharks wore these for warm-ups last night. 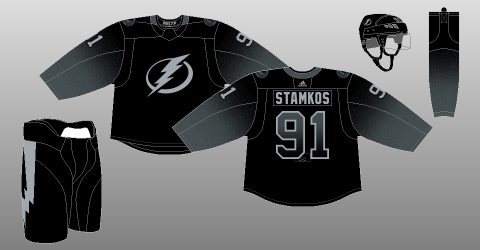 There have been so many nice warm up jerseys this year, but I wish they weren’t on a generic practice jersey template. That looks better in concept than it would look on the ice. 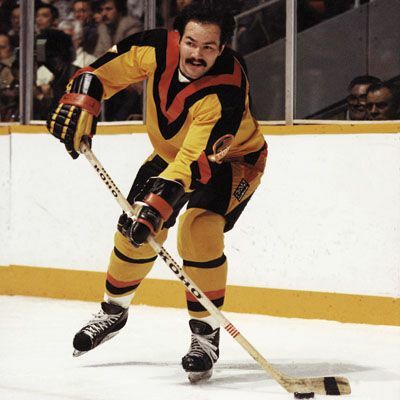 An acceptable fashion jersey but nothing that should be worn in NHL-sanctioned competition. I like the idea of a black-gray Lightning; those are two colors you associate with a lightning storm, of course (along with white). But this isn't the way to make it look. 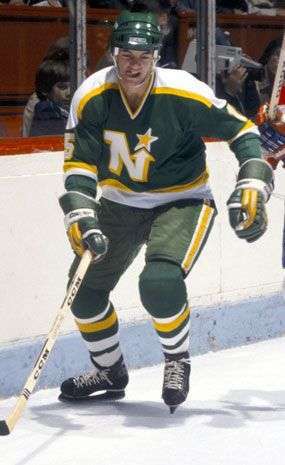 And while I'm here, serious question - NHL teams have different colored jerseys, helmets, and socks depending on home-and-road, and even different colors for their alternates. Why are alternate breezers such a rare item, comparatively speaking? Some teams might have a different pant color for their alternates, but every team going back as far as I can remember wears the same breezers home-and-away, even if that means their secondary color is more prominent with their away uniform than their primary color is (i.e. - Rangers wearing red breezers with white jersey, Habs wearing blue with white, etc.). Pant shells historically are rather superfluous and expensive and an additional pain to drag around on the road. It’s simply become established hockey design that every team gets one pants design. It also serves to tie the home and road looks together. Most teams also only have one set of gloves, which tend to be the same color as their breezers. @Chromatic, appreciate your response to that. As to the above quote, I do understand why this would be the case, because gloves are equipment, and equipment like that usually needs to be broken in, so I can understand why something like this would be the norm. The breezers have always been the one I was curious about. 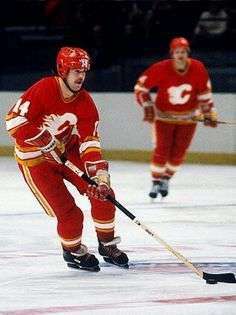 Some teams, in theory, would look better if they wore their home colored jerseys as their road breezers, but seeing as how literally nobody does that, there surely had to be a rationale behind that. Hockey needs to bring back multi-coloured gloves. VGK is the only team I know of with home/away gloves, but it wouldn’t be hard for others to do this. Hockey gloves aren’t exactly baseball mitts, so they’re not hard to break in. The average player has at least two active sets of gloves so they can switch mid-game when one set gets soaked with sweat. My point is that I think since most team only have one set of breezers, they also use one set of gloves that matches the breezers to balance their look. 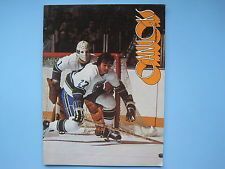 I’m not up on my hockey gloves—are there any current teams like the pictured Canucks that have three-color gloves (not including white)? There are several that have two colors plus white (Rangers, Islanders, Devils) but surprisingly most teams have monochrome gloves (Blackhawks, Bruins, Pens, Canucks, etc. ), with the most popular scheme being simple black and white. EDIT: The Wild have three colors on their gloves: a green and red body with the manufacturer logo in cream. I don't know why white doesn't count, but in that case no.